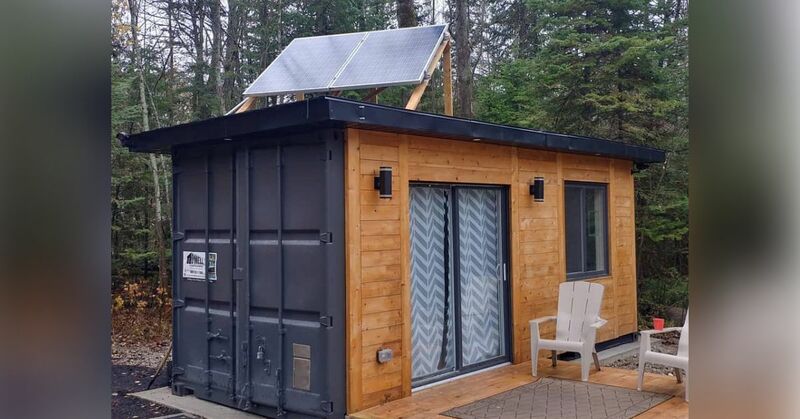 Recognizing the need to have more sustainable options for housing, two entrepreneurs started Dwell Containers Canada, a company that designs and builds container homes, in January 2017. Mike Reid and his partner Dave, who run a concrete and construction company in Toronto, believe it is important to live responsibly. At the heart of this company is a green eco-friendly philosophy. Everything is done with this concept in mind, from sourcing of the materials to construction and even promoting off grid living. All Dwell containers come with standard features such as Corten corrugated steel exteriors. The floors, walls and ceiling of the interiors are insulated with a 2-pound closed cell spray foam. Electricity is provided by a fully integrated 30 amp panel as well as LED recessed spotlights. Just like a regular house, each container is fully customizable. Current models are the Dwell 20 and the Dwell 40. Whether you simply want to buy a ready-made house or to do it yourself, the company is there to assist you. It offers three services: turn-key design and build, project management and consultation for DIYers. In February, the company started offering webinars on container building. With this paid service, anyone who is interested in container homes can download valuable materials. It all starts with a plan. This floor plan of the Dwell 40 clearly shows how the space inside the container is laid out and distributed. Framing on this 40-foot one-bedroom cottage provides the skeleton that will support the rest of the structure. Who knew that something as ordinary as a shipping container could look so good? Set against the great outdoors, it can actually take your breath away. Whether it’s sleek or modern, country or rustic, you can achieve whatever kind of look you want inside a Dwell 40 home. When you purchase a Dwell 40, you don’t have to worry about transporting it because the company delivers it to your location. You won’t find any reason not to love your Dwell 40 home, no matter what season. The possibilities of what you can do with a Dwell container are nearly endless. With just a little imagination, you can come up with a home that is right for you and your family. These containers are ready to be shipped to become sustainable homes for people who want to live in a more environmentally friendly way.